Boundin' bounces joyfully to a musically narrated story. Luckey not only directed this sweet little animation, but he also wrote it, narrated the script, provided a voice for the jackalope and composed the music. Suffice to say, Boundin' was his spring into animation glory. 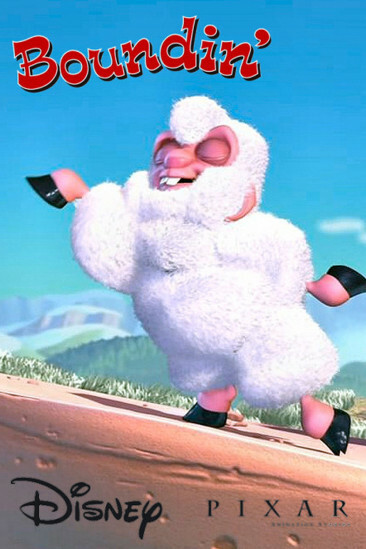 A dancing sheep that remains popular with the other animals, one day becomes sheared. Now the laughing stock of the rock they reside on, the sheep loses all confidence. A benevolent jackalope then approaches and teaches the sheep to "bound" rather than dance, allowing him to restore his confidence and overcome his fear of shearing. A delightful message for younger viewers to adhere to, with a variety of musically tuned animals to enhance the accessible entertainment. The animation was excellent with a nice attention to detail for the environment, such as tumbleweeds blowing in the distance. The character models were well rounded and clearly differentiate each animal. The musical narration, whilst doing its best impersonation of Johnny Cash, was unfortunately forgettable and lost the buoyancy of its message. A more upbeat tune would've suited the narration, considering it's a story about "bounding". However the lyrics remain poignant and are simple enough for children to acknowledge. Still, another consistently slick short animation from Pixar that ranks among the upper echelon of their canon.